1. Winner of the 1987 Pritzker Prize,which architect's major designs have included the gymnasium and swimming pool for the 1964 Tokyo Olympics, the Fuji Television Building in Tokyo and city plans for Nigeria's capital city, Abuja? 2.Opened in 2009 by Alexander Ivanov, the Faberge Museum is home to over 700 Faberge Eggs, including the Rothschild Egg, the Karelian Egg and the last ever made Faberge Egg. In which Southern German city is it located? 3.In Greek mythology, it was encountered by Odysseus on his wanderings. Located in the Straits of Medina, what name was given to the huge whirlpool (first believed to be a sea monster),which swallowed ships whole? 4.Among those considered by the Catholic Church to have held the position of Pope, only three are specifically mentioned in the New Testament. St Peter is one, name either of the other two? 5. 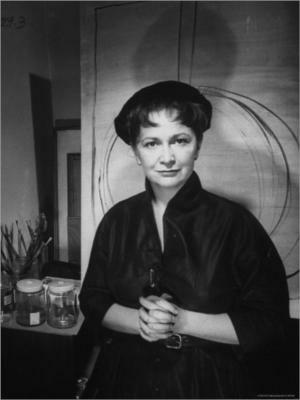 (Picture) Including Jackson Pollock, Willem de Kooning, Barnett Newman and Mark Rothko, the group of rogue abstract artists known as the 'Irascables', had only one female member. Who was this Romanian-born American painter who died in 2010 aged 100? 6.Popularised by Richard Wagner in his opera Gotterdammerung it translates in English as 'Twilight of the gods'. What name is given, in Norse mythology, to the series of events that ultimately result in the deaths of major gods, such as Odin, Thor and Loki? 7. In October 2014,which French novelist was awarded the Nobel Prize for Literature, 'for the art of memory with which he has evoked the most ungraspable human destinies and uncovered the life-world of the occupation'? 8. Noted for his design of the 1972 Munich Olympic Stadium, which German architect and structural engineer was awarded the 2015 Pritzker Prize, shortly before his death in March 2015? 9.Influencing major trends such as Bauhaus and the De Stijl movement, it was developed at the Moscow Institute of Artistic Culture. Pioneered by the sibling sculptors Antoine Pevsner and Naum Gabo, what name was given to the 1920s style of art that was described as an industrial, angular style of work? 10.One of the first graffiti artists in Paris, he has been described as the 'Father of stencil graffiti' and has been a huge influence on other graffiti artists, in particular Banksy. By what rodent-sounding 'street name' is the artist Xavier Prou better known?